Four County Career Center’s FFA chapter members placed in the top 10 at the FFA district contests. Competitors from Fulton County are, from left, Ariel Kohlhofer of Delta, Elizabeth Gafner of Delta, Joslyn Tijerina of Archbold, Brianna O’Neill of Wauseon, and Cade Smith of Wauseon. Veterinarian Assistant students placed first as a team in the Veterinary Science competition and third in the Animal Management contest. Ag/Diesel Mechanics, Diesel Mechanics, and Powersports students placed first as a team in the Ag Skills contest and third in the Outdoor Power Equipment contest. Absent from the photo is Brock Ranzau of Archbold. The FFA advisors for these programs are Stephanie Pippin, Denton Blue, Jason Elston, and Larry Soles. https://www.fcnews.org/wp-content/uploads/sites/45/2019/03/web1_FCCC-2019-ffa-district.jpgFour County Career Center’s FFA chapter members placed in the top 10 at the FFA district contests. 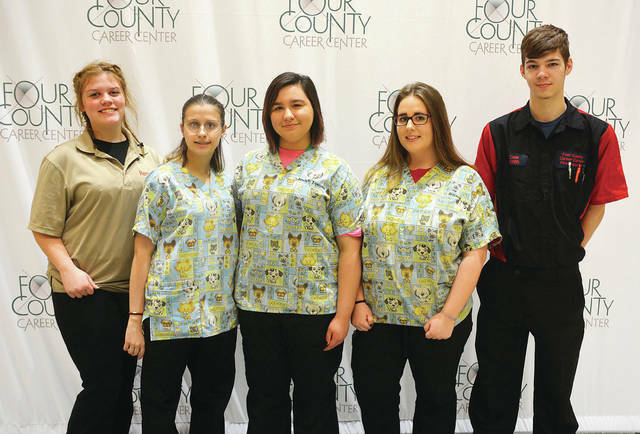 Competitors from Fulton County are, from left, Ariel Kohlhofer of Delta, Elizabeth Gafner of Delta, Joslyn Tijerina of Archbold, Brianna O’Neill of Wauseon, and Cade Smith of Wauseon. Veterinarian Assistant students placed first as a team in the Veterinary Science competition and third in the Animal Management contest. Ag/Diesel Mechanics, Diesel Mechanics, and Powersports students placed first as a team in the Ag Skills contest and third in the Outdoor Power Equipment contest. Absent from the photo is Brock Ranzau of Archbold. The FFA advisors for these programs are Stephanie Pippin, Denton Blue, Jason Elston, and Larry Soles.